Growing up in the 1970s, Chad Fitz has fond childhood memories of visiting the planetarium at the University of Arkansas at Little Rock. It’s one of the things that got him interested in science as a child. Fitz, now a senior client relationship and delivery manager for FIS, is giving back to his alma mater and helping encourage math and science education through his work on the Dean’s Science Council. Council members advocate on behalf of the UA Little Rock College of Arts, Letters, and Sciences and garner community support for science programs. Their efforts include raising funds for faculty and undergraduate research, the Fribourgh Award receptions, and the Science Olympiad. Fitz has been volunteering with UA Little Rock since 2010, when he worked at Acxiom, which had a committee that partnered with the university. Fitz attended the University of Arkansas at Little Rock and graduated with a Bachelor of Arts in English in 1990 and later earned a Master of Arts in Technical and Expository Writing in 1992. At UA Little Rock, his mentors were Pat Moore, associate professor of English, and Sally Crisp, assistant professor of social work. 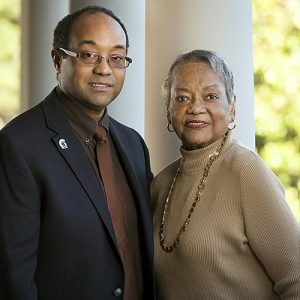 Fitz feels that his UA Little Rock education, which provided a strong basis in both liberal arts and science and technology, helped him go far in his career. Thanks to the encouragement from his professors, he had good internships and graduated with a great portfolio. He got his first full-time job at Biotechnical Services, Inc. in North Little Rock through an internship program at UA Little Rock and worked there while earning his master’s degree. Fitz worked as a technical writer at Alltel Information Services, which later became FIS, and soon found himself immersed in the world of software development. In 2000, Fitz joined Acxiom, a global marketing technology and services company, as a business unit leader in software development, where he led development of a real-time marketing solution and successfully implemented it at key customer sites for the financial services industry. He left Acxiom in 2012 as a vice president of product management and now works at FIS, where he is responsible for delivering digital banking services and operations for retail banking clients. Fitz lives in Little Rock with his wife, Julie, and their children, Sullivan and Josie.